Interactive roadshow celebrating 30 years of championing animal rights. Responsible for: concepts, copywriting, art direction and creative direction. 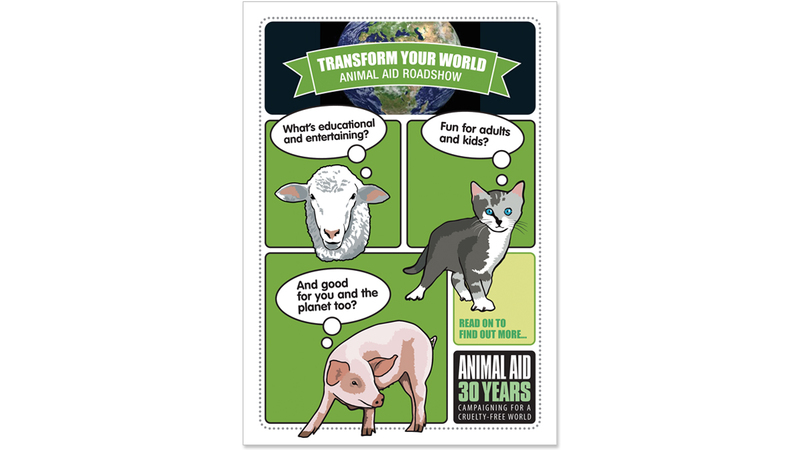 Animal Aid – Concepts, copywriter, art director and creative director. I had already worked with Animal Aid to create hard-hitting campaign films highlighting serious issues such as factory farming and animal testing. To celebrate their 30th anniversary, they wanted a campaign that would have more of a family-friendly feel, so that they could connect with a wider audience. The ’10 Ways to Transform Your World’ roadshow had something that everyone could engage with. It encouraged people of all ages to explore ideas such as recycling, vegetarianism, cruelty-free products and the benefits of cutting down on dairy products. Roadshow trailer, direct mail, literature, campaign film and touchscreen game.